^ Martin Fleischmann, Stanley Pons (1989. 261). “Electrochemically induced nuclear fusion of deuterium”. J. Electroanal. Chem. Vol. 263: p. 301 and errata. ^ Martin FLEISCHMANN, Stanley Pons (1992). “Calorimetry of the PD-D2O System: from Simplicity via Complications to Simplicity.”. ICCF3: p. 47. ^ a b 岡本ら (1993). 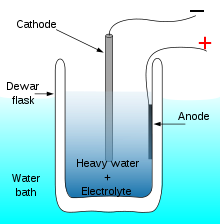 “A Role of Lithiumfor the Neutron Emission in Heavy Water Electrolysis”. Frontiers of Cold Fusion (ICCF3): p581. ^ Nuclear transmutations in thin-film nickel coatings undergoing electrolysis. (PDF) J. New Energy, 1996. 1(3): p. 5. ^ Yamaguchi, Eiichi, and Takahashi Nishioka. "Direct evidence for nuclear fusion reactions in deuterated palladium." Frontiers of Cold Fusion, Proceedings of the Third International Conference on Cold Fusion. 1993. ^ 山口栄一, 西岡孝. "28p-G-13 Pd: D/H における急激な構造相転移と異常核効果." 年会講演予稿集 46.4 (1991): 198. ^ 山口栄一. "常温核融合の進展に画期的成果--独自の真空法でヘリウム 4 を検出." OHM 80.1 (1993): p1-3. ^ a b Yoshiaki Arata, Yue Chang Zhang, X.F. Wang (2009). “Production of Helium and Energy in the "Solid Fusion"” (PDF). ICCF15. https://www.lenr-canr.org/acrobat/ArataYproduction.pdf. ^ 大山和男 (2018). “6Li Quantity Suitable for Nuclear Fusion Mechanism”. JCF19 ABSTRACTS JCF19-7. http://jcfrs.org/JCF19/jcf19-abstracts.pdf. ^ Kazuo Ooyama (2017). “Nuclear Fusion Mechanism in Metal Crystals”. Jcf18 Proceedings: P55. http://jcfrs.org/file/jcf18-proceedings.pdf. ^ Kazuo Ooyama (2018). “Nuclear Fusion Mechanism in Pd Cathode”. JCF19 ABSTRACTS JCF19-17. http://jcfrs.org/JCF19/jcf19-abstracts.pdf. ^ Kitamura, Akira; Nohmi, Takayoshi; Sasaki, Yu; Taniike, Akira; Takahashi, Akito; Seto, Reiko; Fujita, Yushi (2009). “Anomalous effects in charging of Pd powders with high density hydrogen isotopes”. Physics Letters A 373 (35): 3109–3112. doi:10.1016/j.physleta.2009.06.061. ISSN 0375-9601. http://www.sciencedirect.com/science/article/pii/S0375960109007877. Kozima, Hideo. The Science of the Cold Fusion phenomenon, Elsevier Science, 2006. ISBN 0-08-045110-1.